February is here, the first leg of the Champions League is almost upon us and that, of course, means Real Madrid have finally decided to move up through the gears. Since a 2-0 home defeat brought the future of manager Santiago Solari into doubt just over a month ago, Los Blancos have won five of five in the league and seven of eight in total, surging back up into third place and setting themselves up perfectly for their upcoming European tie with Ajax and triple-header of Clásicos with Barcelona. Their absurdly talented young Brazilian Vinicius Jr has been increasingly central to that resurgence with each passing week, and in their 3-0 destruction of Alavés on Sunday, he was at it again, topping off an effervescent display with an equally impressive long-range one-two goal. Ten minutes from the end, Vinicius picked up the ball on the left before spraying a reaching left-footed pass to Marco Asensio. Asensio advanced and crossed it back to Vinicius, who, having continued his run all the way into the box, proceeded to calmly side-foot it beyond Fernando Pacheco and into the back of the visitor’s net. It was a sequence magnificent in its simplicity, slightly reminiscent of the Luis Suárez-Edinson Cavani combination for Uruguay against Portugal at last summer’s World Cup. And for the boy from the tough, working-class neighbourhood of São Gonçalo, it put the icing on the cake of a brilliant 87 minutes. About two hours previously, he had started the game very much as he meant to go on. Within two minutes of the kick-off he had already beaten his direct opponent Carlos Vigaray for pace on two occasions. Neither came to anything, not in terms of a shot or an assist, but the seed of doubt and fear had been sown in the right-back’s mind. From there, it would only get better. On 15 minutes, he turned Mubarak Wakaso, ran towards the edge of the area and stung the palms of Pacheco with a right-footed drive. Then, bang on the half-hour mark, Vinicius set Sérgio Reguilón free down the left with a perfectly weighted nutmeg pass – humiliating Vigaray once more – setting it up perfectly for the left-back to cross and Karim Benzema to convert. Two minutes later, he was running 60 yards with the ball at his feet, beating three players before winning a free-kick on the edge of the area. The opposition defenders, racked with terror, had decided there was no other way to stop him. 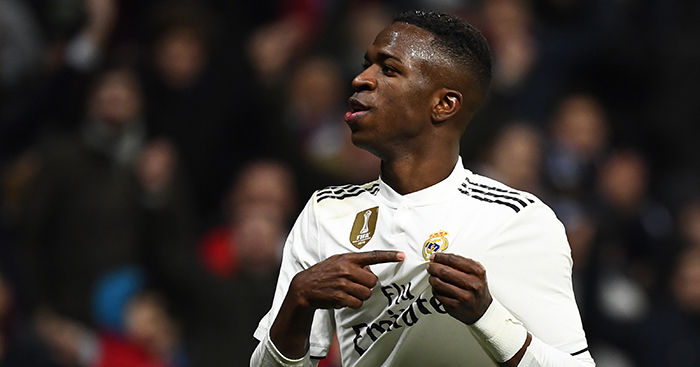 In the second half, Solari took pity on the Alavés right-back and temporarily switched Vinicius over to the right, but the direct running and dangerous dribbling continued, right up until that glorious goal and his subsequent standing ovation as he was replaced by Isco in the dying moments. Those deep reserves of footballing ability have not, however, shocked anyone who watched him coming through with Flamengo or Brazil’s junior teams. By the time he made his full first-team debut in Brazil’s Série A, he had already been talked about for a few years as the great hope, the ‘next Neymar’ tag stuck on his head after seven goals and some soul-destroying skills at the South American Under-17 Championships in 2017. He produced some brilliant finishes at that tournament, including two delicious lobs (one with each foot) and a pair of nutmegs, but the most enjoyable moment came in the game with Paraguay. With his side 1-0 to the good, Vinicius decided to make his superiority clear. Receiving a quick pass, he flicked the ball over the advancing defender’s head with his first touch. Another Paraguayan came to stop him and was embarrassed in exactly the same way. One more arrived to steal it off him and the treatment was applied for the third time. There it was, the triple chapéu – the holy grail of Brazilian street football. For a few seconds the Paraguayan players stood completely still, trying to process the shame that had been brought upon them. On the back of that tournament, and before Vinicius had even started a senior club game, Real decided they would be willing to part with €45million to secure his signature – making sure Barcelona couldn’t steal in as they had done with Neymar. For a few games after he eventually made his bow for Flamengo, the investment looked questionable, with some ineffective performances and strange decision making. Within a matter of weeks, though, he was up to speed to the increased pace and physicality of adult football and was back up to his old tricks, terrifying defenders and hitting the back of the net. The real step up – the moment he made himself an indispensable member of Flamengo’s first team – arrived in a challenging Libertadores away game in Ecuador. Coming on 20 minutes from the end with his team a goal down to Emelec, he took the bull by the horns, scoring two dazzling left-footed goals to turn the tie on its head. From there, his star has not stopped rising. 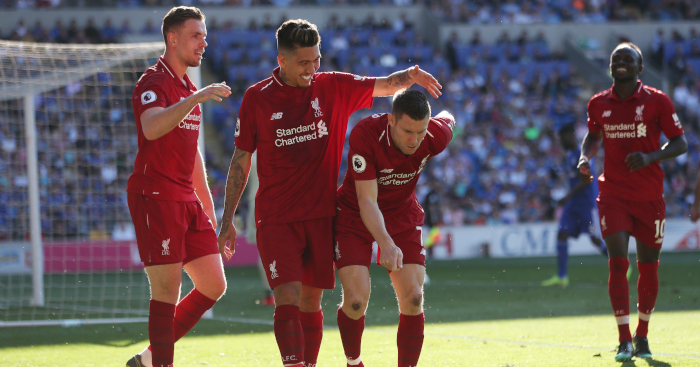 Before he left last summer, he was en route to the Brazilian league’s top-scorer prize and after a relatively short adaptation period in Spain, has continued in the same vein. In the past month there have been two assists for Karim Benzema, one for Lucas Vázquez and, after Sunday, two goals. He’s here and, for Madrid, he’s arrived just in time; a lightning-fast, twinkle-toed man-child dancing around opposing full-backs – people so good at stopping other people dancing around them that they get paid thousands of euros a week to do so – as if he were still playing on the streets of São Gonçalo. And don’t forget that Vinicius is still just 18. There’s plenty more where this came from.